I’m so glad I requested this book on NetGalley. 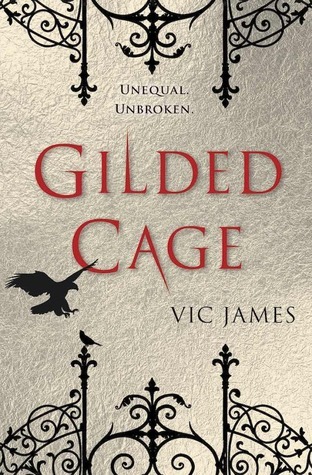 From the dark, magical, and often brutal world, to the hidden political agendas, to the complex, and ambiguous characters, Gilded Cage ranks high on my list of YA reads over the past year. Although Abi and Luke are mentioned in the book description, they’re far from the most interesting characters for me. The Jardine brothers are what drew me into the story and I’m still not sure what to make of them. My opinions of them changed over the course of the novel – I still think there’s more to them than meets the eye and they may not be what they appear at first glance. That’s the beauty of this plot – there’s the top layer with the horrific slavery laws and the brewing rebellion – but there are so many undercurrents, subplots, and questionable motivations, the wheels of my mind were constantly turning, examining every character’s actions. It’s a wonderful challenge for the reader. Yes, this can be a dark, difficult read at times with the slavery and abuse scenes, but with fantastic, descriptive writing, strong characterization, and a unique YA dystopian plot, you’ll be glad you gave it a chance. Gilded Cage is scheduled for publication February 14th, 2017. I agree. Silyen in particular. I’m not sure what his motivations are yet. Hard to tell yet. Love it! Especially Silyen – really looking forward to seeing what book 2 brings.